Image: The team involved in the first game to use video assistant referee technology on Aug 14 at Red Bull Arena. 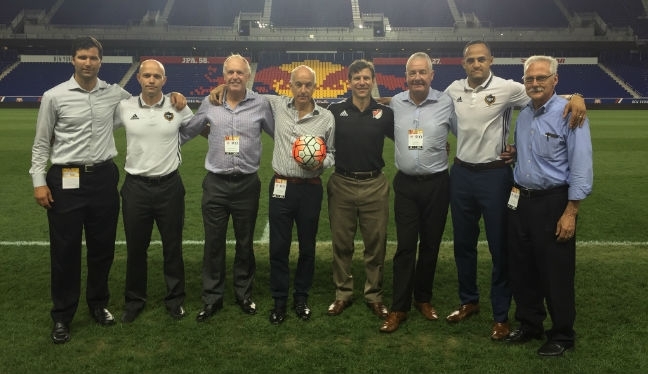 On August 14, 2016, PRO officials Ismail Elfath and Allen Chapman made history as they worked together, using video technology, to make a clear, precise call in a United Soccer League game between New York Red Bulls II and Orlando City B. It was the culmination of many months of hard work and, since then, a number of other USL games staged at Red Bull Arena have utilized video assistant referee technology – historic stepping stones on the way to what could be the permanent introduction of VARs in soccer. The man overseeing the project on behalf of Professional Referee Organization is Training & Development Manager Paul Rejer, and we caught up with him to discuss the technology, his take on it, and what he believes the future may hold. Firstly, can you give us an overall summary as to what your role is within the VAR experiments? I am overseeing the project on behalf of PRO. I have attended all the games and been involved in all the training and preparation for the Real Time Video Review (RTVR) training sessions, starting in Portland in February, Dallas in March, New York Red Bulls in May, June and July. Then the ‘real thing’ at Red Bulls in August and September. Are you honored to be involved in such historic testing in soccer? It’s not only an honor for me personally but also for PRO, MLS, USL and North America. And, of course, the same goes for referees Ismail Elfath and Allen Chapman, who were involved (Ismail as referee, Allen as VAR) in the very first game in the world – New York Red Bulls II v Orlando City B on August 14 – to use the technology, which was an historic occasion. Everyone involved signed the match ball for it to be on display at The International Football Association Board (IFAB). How has the testing gone? Are you pleased? The testing has gone very well indeed, with various challenges for the referee and the VAR, providing us with plenty discussion to learn from. Having David Elleray, Technical Director of The IFAB, present at the first game not only added credibility to the project but he was able to provide us with leadership and guidance, which was essential for us going forward. How have the officials taken to the technology? Extremely well. The technicians from Hawkeye have been teaching and supporting our guys extremely well. We made a conscious decision to only involve four referees – Ismail Elfath, Allen Chapman, Hilario Grajeda and Sorin Stoica – at the actual games until the protocol is formalized and we have the green light to operate RTVR at MLS games. What’s your opinion on the introduction of VAR technology? Do you believe it to be a positive move and has your opinion always been the same? It is definitely a positive move. My opinion has changed as I initially believed it would mean too many stoppages and consequently too much added time, but the pilot games have resulted in fairly minimal disruption. What’s next for VAR, after the test matches? I am attending a RTVR workshop at FIFA headquarters in Zurich in two weeks and the training materials I receive from that will enable us at PRO to organize RTVR training sessions, starting as early as next month. In Allen Chapman, Ismail Elfath, Sorin Stoica and Hilario Grajeda we have four fully-trained VAR’s, the challenge for us now is to train all of our referees, which will be a massive task. We plan to start the training as early as next month and continue through to August 2017. What do you believe the future holds for officiating, and the technology used? I am excited by the prospect and I believe this could change the future of refereeing. If this is introduced officially I believe it would be beneficial to referees. The IFAB will ultimately decide on the future of RTVR and whatever that decision is, it will be based on all the evidence they have gathered over the last year, and will be for the good of the game.